For the most up-to-date version of this text, see Glossary. active recall - the process in which pieces of information are actively retrieved from memory as opposed to passive review. For example, in passive review one might read that the highest divorce rate occurs in the 4th year of marriage. In active recall, you would have to retrieve this information from your memory: In which year of marriage are couples most likely to divorce? If you answer correctly, "4th year", then your memory stability will increase and so will the probability of recall in the future. In passive review, this increase is dramatically less pronounced. In literature, in various contexts, active recall may be referred to as practice at retrieval, active learning, learning based on a testing effect, retrieval practice, test-enhanced learning, active repetition, free recall, and more. auto-postpone - option available with Learn : Postpone : Auto-postpone that makes sure that excess repetitions are automatically postponed before the learning begins (if the option is checked). Auto-postpone uses user-defined criteria in choosing elements that should be postponed. Most importantly, high priority material is protected from being postponed. Auto-postpone affects only the material that has not been processed on previous days. It does not postpone repetitions scheduled for the current day until the next day. branch (in the contents window) - an element in the knowledge tree with all its descendants (incl. its children). All elements in a branch can be processed with subset operations. For example, if you would like to review your physics material before an exam, you could choose the Physics branch in the contents window, and choose Learn on the contents menu (Ctrl+L). You can add new branches with Add, Sibling and Insert in the contents window. The difference between a branch and a category is that a category is associated with templates, and other parameters. Only a few branches are made into categories. hook node (knowledge tree node under which new elements are added as children until the children limit is passed and a new node is chosen automatically). Q: The highest literacy rate in Africa has been reached in [...](country)(1998)? component - any object placed within the visible field of an element. For example, text of a question, picture, video component, spell-pad, PDF file, etc. heuristic measure of difficulty based on the history of repetitions and displayed in the element data window as Difficulty (this measure can be used to sort collections that are to be used by other users; starting with easy items first). dismissed element - element that is not memorized, is ignored in the learning process, and is not kept in the pending queue. A dismissed element can be re-memorized with Remember. Priority of dismissed elements is ignored (at Dismiss it is set to 100%). final drill - the last stage of the learning process on a given day, in which only items that scored a grade less than Good (4) are repeated as long as they continue scoring less than Good. On the next day, final drill queue is again shifted to the end of the learning day. The final drill stage is not executed if Tools : Options : Learning : Skip final drill is checked. Unused final drill queue is deleted after 3 days, and can also be deleted manually. To delete the final drill queue, use Learn : Cut drills. forgetting curve - a graph in SuperMemo that shows how fast the memorized information gets forgotten. A forgetting curve graph shows time on its X axis, and percent recall on its Y axis. It can be viewed with Tools : Statistics : Analysis : Forgetting curves. SuperMemo collects 400 forgetting curves for 20 levels of knowledge difficulty and 20 levels of memory strength. The picture shows an exemplary forgetting curve built on the basis of 16,778 repetitions. hint - a message that makes it easy to understand the use of a given menu item or button in SuperMemo. To view hints pause the mouse pointer over a button or menu item. Hints will show only if hint checkbox is checked on the Actions toolbar. Hints are displayed on the status bar at the bottom of the screen (you can show status bar with Window : Status bar). layout - position and size of windows in SuperMemo. Layouts can be changed with Window : Layout menu. In particular, use Ctrl+Shift+F5 to save your favorite layout. Compare: Template. There is no need to save layouts for contents and browser layouts they are saved automatically. learn-only mode - mode of operation of SuperMemo in which only learning options are available. The two other modes are read-only, in which only review options are available, and full-access, in which all options are turned on. choose Access: Access mode : Learn-only. pending queue - queue of elements that are waiting to be memorized. Option Remember removes the current element from the pending queue while Forget adds a memorized element back to the end of the pending queue. Pending queue determines the order of learning new elements. You can make the entire collection pending, by choosing File : Tools : Reset collection. You can also make a subset of elements pending by using options of the browser menu. read-only mode - mode of operation of SuperMemo in which only reviewing options are available. The two other modes are learn-only, in which also learning is possible, and full-access, in which all options are turned on. choose Access : Access mode : Read-only. repetition category - number that represents the repetition number corresponding to a given interval in the theoretical learning process in which the current status of the OF matrix is used. If you make many repetitions in short intervals (e.g. as a result of mid-interval review), you may have a large repetition number for a short interval. Such repetition number cannot be used in the SuperMemo algorithm. Instead, SuperMemo will look at the optimum interval and see how many times an item would need to be repeated to reach that interval. That number is called the repetition category. R-Factor (retention factor) - the number which says at which U-Factor (i.e. the measure of interval increase) the measured forgetting index (i.e. the measure of forgetting) is approximated to be 10%. This number is unique for different item difficulties and for different repetition categories (i.e. the measure of memory stability). 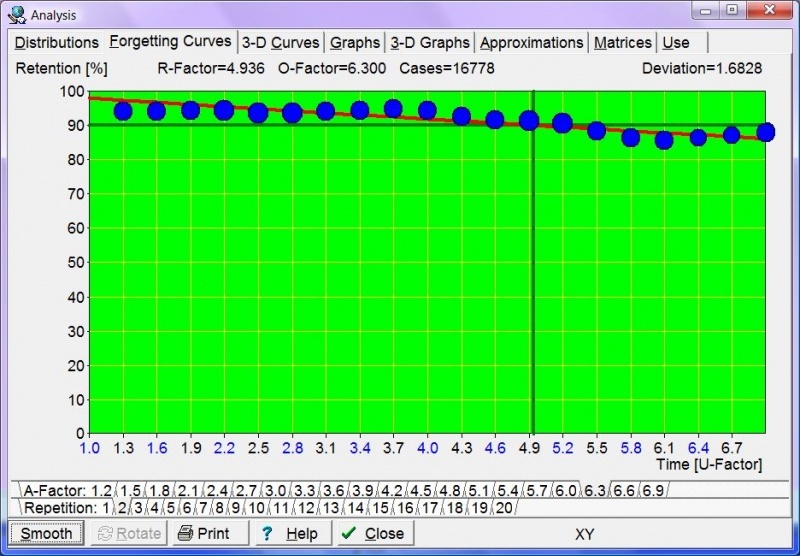 R-Factors can be seen as a vertical green line on forgetting curve graphs in SuperMemo. RF matrix - a matrix that holds all R-Factor values, both measured and theoretical (i.e. those that could not be measured yet). R-Factors are arranged in rows of repetition category (i.e. the measure of memory stability) and columns of A-Factor (i.e. the measure of item difficulty). You can see your RF matrix with Tools : Statistics : Analysis : Matrices : RF matrix. You can create an element subset by using the element browser (e.g. Subset : Save all or Select : Save selection on the browser menu). You can view an element subset with View : Subset.